Litter is messing with natural habitats - and the animals who live in them. But luckily, this little girl got a helping hand just when she needed it most. 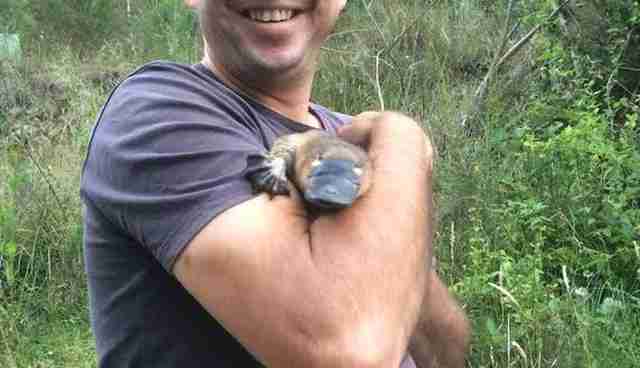 Earlier this month, Wildlife Victoria's emergency response service in Australia was dispatched to a river to save a platypus in dire need. As it turns out, Harriet (as she was named by her rescuers) got tangled up in leftover fishing gear. The most serious part of her dilemma was the fact that a large fishing lure got stuck in her beak, the group's Facebook page said. Volunteers quickly took the young platypus to the Alpine Animal Hospital for treatment. Harriet with one of her rescuers. "We were heartbroken to receive a call about a platypus suffering as a result of human carelessness," Amy Hidge, relationship manager at Wildlife Victoria, told The Dodo. Hidge said Wildlife Victoria frequently receives calls about wildlife getting caught in trash. "We, as humans, are by far the biggest threat to the platypus ... other litter such as plastic cable ties, six-pack holders, elastic bands and food containers are the cause of platypus deaths across Australia. [They're] all preventable," she said, also adding that out of all the native wild animals who call Victoria home, one of the most special is the platypus. "Their presence adds an almost magical appeal to our beautiful waterways," Hidge said. Once the lure was removed from Harriet's beak, she was released back into the wild. ... and of course, always make sure to throw away trash in a can and/or recycling bin. It's best for everyone.